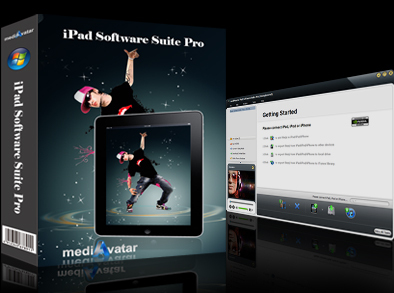 Well designed for Apple iPad tablet fans, mediAvatar iPad Software Suite provides the perfect solution to backup music, videos, photos, books from iPad to PC or iTunes and transfer media files from PC to iPad without using iTunes. As an iPad music/video converter, this iPad manager can also various videos/audios to iPad video or audio formats. You can also download & convert videos from top online websites like YouTube to iPad , and make iPhone ringtones. mediAvatar iPad Software Suite is highly compatible with ll iPad/iPhone/iPod models (iPad, iPad 2, New iPad, iPad Air, iPad mini, iPad mini with Retina display, iPhone 1st gen, iPhone 3G, iPhone 3GS, iPhone 4, iPhone 4S, iPhone 5, iPhone 5s, iPhone 5c, iPod touch, iPod touch 5, iPod nano 7 and other iPod models), and also supports connecting multiple iPad/iPhone/iPod devices at the same time to transfer files in between. All the features apply to iPhone/iPod as well. Transfer movies, music, photos, playlist from iPad to PC or iTunes, and also transfer media files from PC to iPad, even transfer PDF/EPUB books between iPad and PC. Download and convert online videos from video broadcasting websites (YouTube, Metacafe, Dailymotion, Revver, Vililife, BREAK, Vimeo, Stickam, Blip.tv) in 1 step and transfer online videos to iPad directly. Full support for synchronize via Wi-Fi. Various video/audio formats can be converted to iPad videos or music. Input formats include M2TS, MTS, AVI, MP4, MPEG-4, MPEG, WMV, DAT, TS, MPV, NSV, M4V, MOV, QT, H.261, H.264, MP3, AAC, WMA, AAC, AIF, AIFF, AC3 and many others. Transfer application by dragging and dropping between PC and your devices, it can also support to manage application document for some applications. Make any videos or music into iPhone ringtones and transfer them to iPhone directly. Introduces CUDA technology and supports GPU to speed up the iPad video conversion processes. Allows transferring iPad playlists between multiple iPad, iPhone and iPod devices, besides managing iPad playlists just like iTunes. You’ll enjoy the album art in your music collection even more. Grid View lets you browse all your music, movie, picture by their cover art. Or search your collection by Album List View, Artist list view, Genres list view or Composers list view. View your music playlist in Thumbnail. You can even choose the image from your computer to put it as a thumbnail image. Apply the image to whole genera or album or playlist. Now you can connect multiple iPad, iPhone and iPod devices at the same time to manage them and transfer movies/music/photos in between: iPad to iPad/iPhone/iPod, iPhone to iPad/iPhone/iPod, iPod to iPad/iPhone/iPod. Filter iPad videos, music, photos and ebooks or enter keywords to search what you want quickly. For well management, you can change the track information including name, artist, album, composer, year, and even make comments and rate your music files. Take a snapshot of your favorite movie images and save them as JPG, PNG and BMP files. The built-in player of the iPad Software Suite enables you to preview iPad videos, audios and movies. Once you insert your iPad, the application will instantly read and show the device information including capacity, version, serial number, format and type. User-friendly and multilingual interface available: English, German, French, Italian and Spanish. Download online videos to iPad; Convert videos/audios to iPad; Backup iPad music, movies, photos, books, ringtones to PC/iTunes; Create iPhone ringtones.